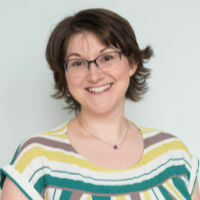 It’s time for another installment of Inspiring Women in Project Management and today I’m delighted to introduce you to Traci Duez, chemist turned project manager and now someone who inspires women herself. 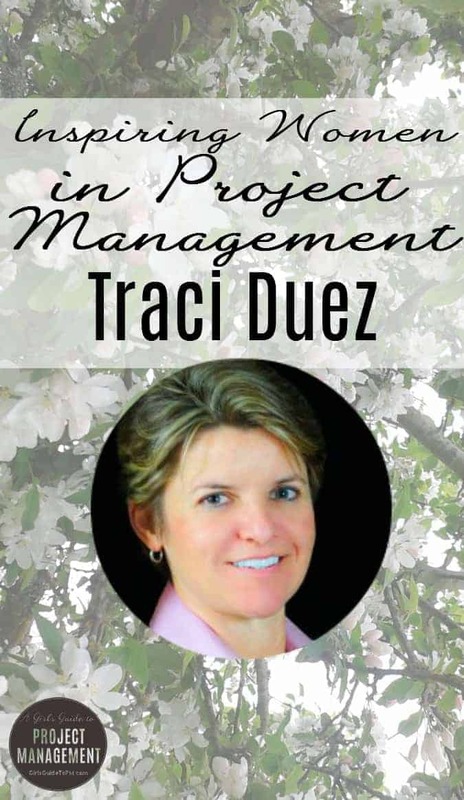 I can say that categorically because I first came across Traci when I attended a PMI Global Congress in Denver, my first one ever, and I went to her presentation. She probably doesn’t remember me Actually she says she does and she let me interview her (watch that here: start the video at about 6.40). And I was pretty inspired by how much energy she had on stage and how passionate she was about getting more productivity from your team. So, without further waffle from me, let’s get started. Traci, how did you get into project management? Do you have a favourite project that you worked on? Interestingly, it wasn’t viewed as a complete failure. The client figured out after $1.5m that their concept (which they were going to invest over $20m in) wasn’t going to work. Now you work in consulting. I know the jump to running your own business wasn’t always on the horizon for you. Have you ended up, career-wise, where you expected? An interesting question as I didn’t believe that I COULD do what I’m doing now. I was always shy and kinda backwards. I worked very hard and was always committed to what I was doing so my performance was outstanding. Since I didn’t like people (or more accurately felt people wouldn’t like me), I never sought out leadership roles yet was consistently encouraged to take them on. However, in the back of my mind since I was in my teens, I used to rehearse speeches that would motivate and inspire people. I also always loved to coach people. I coached basketball, softball, and baseball since I graduated from high school. I think it was almost inevitable that I ended up having my own business where I speak in front of PMI chapters and corporate teams teaching and coaching them in leadership development and self-improvement. Was it hard to break away from a corporate job and go it on your own? Hmmm… I feel like I want to say “yes” but in truth, it wasn’t at all. When you align who you are with what you do, life and business is pretty easy. Did I have to do things that I’ve never done before? Yep. Was it scary? Not really because I knew that I had it in me – it was a part of becoming the person that I want to become. Failure is only feedback. I use my chemistry background to approach the unknown as an experiment. I create a hypothesis and then act on it to either disprove (others might call this failure) or prove the hypothesis. No experiment is useless. All experiments provide data. What’s the most memorable thing that a client has ever taught you? Great question and hard to answer because I continue to learn from my clients every day. If I had to pick one thing it’s actually what I teach my clients… ask more questions and actively listen to the answers. What advice for you have for women who want to start a career in project management? Well, I must admit that I don’t think women should do anything different than men. I think you must figure out who you are – what attributes and characteristics are you wanting to obtain and attain in your life. Who do you want to become? I encourage my clients to think of their retirement party or their funeral… What 6 words do you want to hear as those closest to you describe the person you are/were? Do you want to hear them say… “That Elizabeth, she was amazing with Gantt Charts!” And, “Her risk management plans were to die for.”? I don’t think anyone would say that about my Gantt charts! If a project or task doesn’t help you to become more of the person you want to be, don’t do it!! I know that might sound harsh yet we are only on this earth for a very limited amount of time. I believe you are put on this planet to become the person you want to become. No one is going to be you. No one is going to help you become who you want to become. That is your “job” and your purpose. 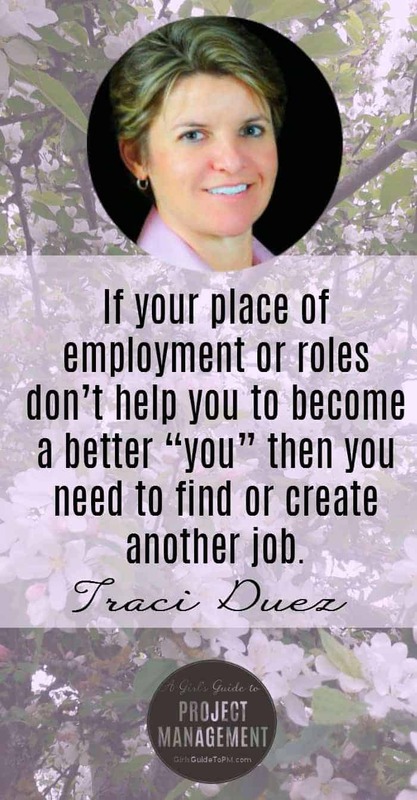 If your place of employment or roles don’t help you to become a better “you”, you need to find or create another job. This planet needs more people who are willing to be who they are – not in a rude and superior manner… just people who will lead others and help them to become the person they want to become by helping them gain the attributes and characteristics they want to attain in their lives. In project management, you have a unique opportunity. You get to help people accomplish the goals set forth in the project while helping them to become the person that they want to be. What an amazing, worthwhile and valuable role to have to make a difference in the world! Read Traci’s book, Breaking Free*, full of practical actionable steps to create new habits. * That’s an affiliate link. It doesn’t cost you any extra but if you click and buy I’ll receive a teeny commission towards helping keeping the blog going. Thanks!